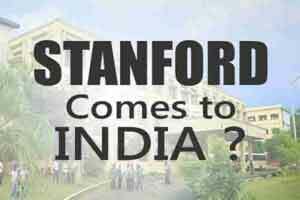 Greater Noida in Delhi/NCR is likely to be home to the US based Stanford University’s first medical college in India. The sprawling campus of one of the world’s most prestigious university will be built on a 100-acre land area. Indian health care company GVK EMRI is reported to be assisting the American University, and is likely to be the Indian venture partner for Stanford here. Indian Prime Minister’s recent visit abroad has been perceived to be good for FDI investment in India especially in the field of Medical Education. Only recently, the Indian medical community cheered over the news of King College Hospital, UK, setting up its presence in India. And now it is the illustrious Stanford University, a prestigious academic research institution based in the Silicon Valley, in California. FDI can be seen as an extension of the foreign private sector investment in medical colleges, to boost the medical education in India. It will only ensure increase in supply of professionals, including doctors and nursing staff, domestically. As reported by TOI, The Yamuna Expressway Industrial Development Authority (YEIDA) has earmarked a plot in Sector 24A for the medical college. “Land measuring about 150 acres has been earmarked for the prospective investor. This land is located along the Yamuna expressway,” said Rama Raman, chairperson of YEIDA. “It will be allotted when the investment in finalised,” added Khosla. Stanford needs 100 acres of the land for the campus. During a recent visit by Khosla, land options and incentives being provided by the Uttar Pradesh government were shared with him, a senior YEIDA official said.